Hops sourced from the Yakima Valley in Washington give this IPA a complex profile with spicy citrus notes. Isn't it time you made the leap from beer drinker to beer brewer? Show your love for the legendary, seafaring ale of the British Empire with this IPA brewing kit containing everything you'll need to turn your kitchen into a craft brewery: 100% malt extract, specialty grains, high quality yeast, and, of course, aromatic Summit and Cascade hops sourced from Washington state's Yakima Valley. Transformed through the simple techniques and included equipment, the finished ale brandishes a delightfully complex hop profile with citrus, floral, and spicy notes. Doesn't that sound more rewarding than just using a bottle opener? Makes one gallon, or ten 12 oz. bottles. Assembled in Orlando, Florida with US-grown ingredients. Want to bottle your brews? Check out our DIY Bottling Kit. Visit our blog to see the UncommonGoods team give Beer Making Kits a try in a Homemade Beer Tasting Brew-haha. Looking for more craft brews? 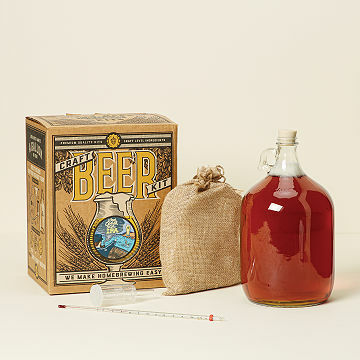 Try our other DIY Beer Kits! packaging - 9" L x 9" W x 16" H; 6 lbs. Do not leave in extreme heat or cold. Beer will ferment at 60-75 degrees F, no cooler. For best results, keep refrigerated and use within one month of receipt. - grain bag and instructions. Please note: while the equipment included in the Beer Brewing Kit (listed above) can be reused many times, the ingredients will brew one gallon. Each Refill Kit contains ingredients to make one additional gallon. Note: appearance of the malt extract may vary. Click here to see brewing instructions. Hops can pose a risk to dogs if accidentally consumed. Take care when disposing of spent hops. This is for my father in law. He really liked trying something new. I got this as a Valentine's gift for my boyfriend and it's absolutely perfect. It contains everything you need to brew your own beer. The instructions are detailed but very clear. Can't wait to try the beer! So far I recommend this to anyone. It came packaged very well, and contained most of what I needed to brew the beer. The instructions we're easy to follow, and the ingredients seemed of good quality. My wert is currently fermenting right now, so I am not sure what it taste like yet. Best gift ever for them. Yes, because of the quality & because of the quick delivery. Everything that I have ordered exceeded my expectations, the jewelry is so well made and unique! The beer kits are perfectly packaged. My go-to gift place! The packaging is very appealing. I bought this for my husband who is interested in brewing beer and loves IPAs. I haven't given It to him yet but know he will love it! My boyfriend had been saying for months that he wanted a home brew kit So I got him this for our anniversary, and he freaked. He loved the box it came in and how straightforward everything seemed to be. This is a great affordable gift and I highly recommend! My husband wants to try all of them!